Birds are amazing architects and build a wide variety of nest types, using different materials and choosing different locations for construction to suit their needs. No matter which birds may be nesting in your yard, however, it is easy to give them a helping hand and help build a safe, comfortable bird’s nest. Do Birds Really Need Help Building Nests? Of course, birds are perfectly capable of building nests without human assistance, and billions of birds nest successfully each year with no help at all. Bald eagles create huge, generational nests with sticks and twigs, chinstrap penguins collect the perfect pebbles for their nest mounds, laysan albatrosses scrape shallow depressions in the grass, and many other birds also build their best nests without any human help. Today’s most common backyard birds, however, face a range of unique threats that can impact their nesting success. Expanding developments diminish natural habitat, and suburban landscaping practices remove dead trees that would be ideal nesting locations. Bagging old leaves and grass clippings removes prime nesting material, while outdoor pets, feral cats, and strays threaten nests and the baby birds they shelter. All these hazards make it more difficult for birds to nest, but birders who lend a helping hand with nesting sites, nesting materials, and nest safety can make it easier for birds to raise their families. A bird won’t build a nest if there is no safe, suitable place for that nest. There are many different locations that different types of birds prefer for nesting, and savvy birders will try to provide multiple nesting sites in their yard. Mature deciduous and evergreen trees are popular with many nesting birds, while birds that prefer lower nests may choose thorny bushes or dense shrubbery to build their homes. Thicket-like plantings are ideal for many ground-dwelling birds that will nest on the ground in these hidden areas. Cavity-nesting birds, on the other hand, will prefer hollow snags, including dead trees and fallen logs. The more of these natural nesting areas that are in a birder’s yard, the more likely it is that birds will take up residence. With multiple nesting sites available, more birds will be willing to build nests in the yard and they will stay safer as they nurture their chicks. Natural, degradable nesting materials are always best, because they will be most familiar to birds and most flexible as nesting needs change while hatchlings grow. It can be very disappointing to help build a bird’s nest only to see the nest actually hurt the birds it is supposed to protect. 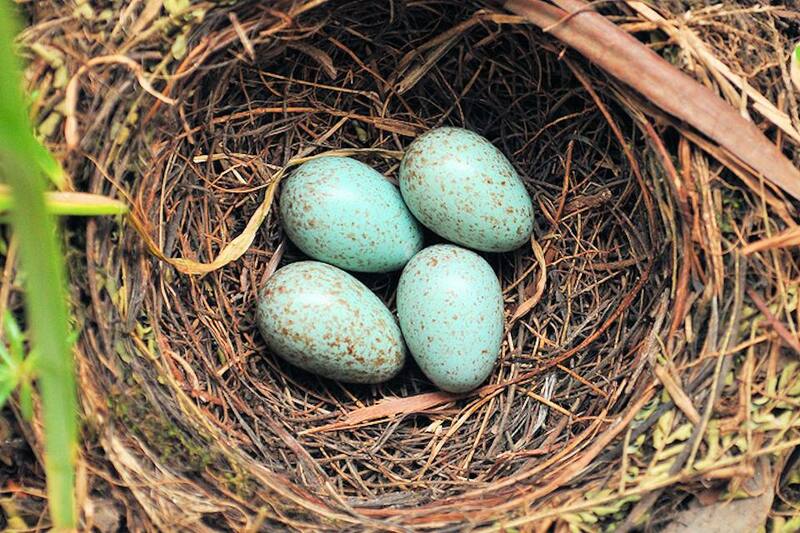 Conscientious birders should take several steps to be sure their bird nests are safe. Choose safe birdhouse designs and ensure entrance measurements are suitable for the nesting birds. This will maximize birds’ space but still ensure that no intruders can easily access houses to disturb the eggs or attack either brooding adults or vulnerable chicks. Use baffles and other barriers such as thorny bushes or fences to protect birdhouses and nests from predators and inquisitive pets. The more isolated the house or nest is, the safer it will be from unwanted disturbances. Avoid touching bird nests except in emergencies, such as if a nest is in a dangerous location or if the nest falls during a storm. Human odors on nests can attract predators, and close contact can stress brooding birds and cause them to abandon the nest. Resist the temptation to check on the nest or act as a surrogate parent to baby birds. If you find a baby bird that requires assistance, treat it carefully and make every effort to return it to its parents’ specialized care. Take steps to discourage nesting birds if they are using unsafe nesting sites, such as places where the nest will be at risk from predators, environmental hazards, other nearby activities that could endanger adult birds or chicks. Most birds have good parental instincts and will build nests that are safe and suitable for their offspring. By offering a helping hand with safe nesting sites, high-quality nesting material, and safety precautions to protect nests, birders can help build a bird’s nest and ensure the feathered family will thrive.